Posted in: BSU Journal Club. Tagged: dust devils. 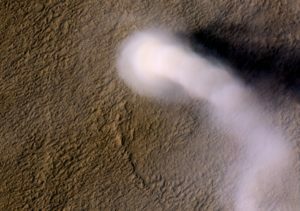 A martian dust devil observed by the HiRISE instrument, in orbit around Mars. Dust devils, whirling columns of fine particulates, have captured imaginations going back at least to the ancient Greeks, but their inner workings continue to confound and surprise scientists. Dust devils are common in arid regions on Earth, and on Mars, where “arid” doesn’t begin to describe the climate, dust devils are ubiquitous. Especially puzzling, dust devils are better at lifting dust into the air than they ought to be. For example, in lab-simulated vortices, even when the winds are barely above a breeze, small dust grains seem to miraculously levitate and dance. So it seems that some force other than just wind must be important for lofting dust in devils. During our research group meeting today, we discussed a recent study by Gabriele Franzese and colleagues looking at one possibility: electric fields within dust devils. As dust grains clatter around within the turbulent body of a devil, they can collide over and over again, which can transfer charge between the grains similar to the process that generates static electricity. And, for reasons that aren’t well understood, small grains like to collect negative charge. Since small grains can be more easily lifted than large ones, small, negatively charged grains end up at higher altitude than large grains in dust devils, resulting in charge separation and a electric field. In the same way static electricity can lift small pieces of paper, these electric fields can draw in more dust grains and help explain the surprising ability of devils to lift shrouds of dust. From Figure 5 of Franzese et al. (2018), the electric field associated with a dust devil. 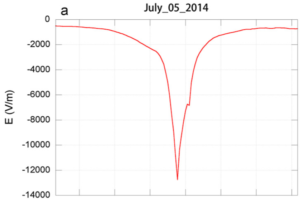 For their field study of active dust devils, Franzese and colleagues set up meteorological equipment in the deserts of Morroco and left it there, steadily measuring wind speeds, dust loading, and electric fields. As dust devils skittered past their instruments, they registered as dips and spikes in the data logs. After recovering the instruments and analyzing the data, Franzese and colleagues found more than 500 dust devils had visited their instruments over a three month time-span. The dust devils displayed a wide variety of shapes, sizes, and, most importantly, electric fields. The picture at left shows the electric field measured for one particularly strong dust devil. In this case, the devil exhibited an enormous electric field, 12,000 V/m. For comparison, such strong electric fields usually seen within storm clouds. Franzese and colleagues show that the strength of field measured for a devil correlates one-to-one with the amount of dust within the devil, so it seems likely electric fields do play some role in the lofting the dust. Since humidity in the air can wick away static charge, dust devils on arid Mars probably exhibit even stronger electric fields than on Earth, which may help explain why martian devils are so much more common there: even faint whirlwinds manage to lift dust. These same electric fields could also present a danger to human exploration of Mars, though, potentially damaging sensitive electronics. Or at the very least, making a case of the Mondays even worse.